Eight days of DIFF’s trademark silver-screen magic closed today with an epic Closing Night Gala, marking the close of the 14th edition of the Festival. DIFF took over the city between 6 – 13 December with screenings of 140 films from globally acclaimed filmmakers and regional talent, and unparalleled industry networking opportunities and insights from the best in the business today. Continuing to raise the profile of Arab film on an international stage, the renowned film festival hosted a diverse selection of galas, special presentations, live performances, red carpet events and informative industry sessions, which made the Festival’s 14th year an unforgettable experience for all. DIFF’s Closing Night Gala saw the most recent adventure from a galaxy far, far away, ‘Star Wars: The Last Jedi’, enjoyed by a capacity audience. The next instalment in the Skywalker saga held its premiere at the Madinat Jumeirah, and was welcomed to the Festival in true Coruscant style with a Star Wars takeover for the final gala. 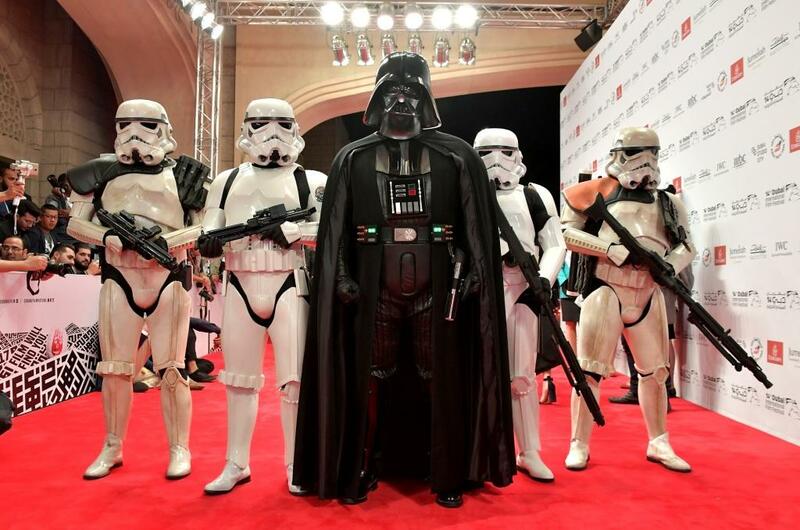 Characters from the decades-spanning franchise graced the red carpet as DIFF audiences turned out in their best Star Wars costumes to ensure the Festival’s final screening provided a fitting end to a spectacular week. Written and directed by acclaimed filmmaker Rian Johnson, the film features an interstellar cast of stars including Mark Hamill, Adam Driver, Daisy Ridley, John Boyega, Oscar Isaac, Lupita Nyong’o, Andy Serkis, Domhnall Gleeson, Anthony Daniels, Gwendoline Christie, Kelly Marie Tran, Laura Dern and Benicio Del Toro. The film also stars Carrie Fisher in her final role. In ‘Star Wars: The Last Jedi’, the Skywalker saga continues as the heroes of The Force Awakens join the galactic legends in an epic adventure that unlocks age-old mysteries of the Force and shocking revelations of the past. His Highness Sheikh Mansoor bin Mohammed bin Rashid Al Maktoum presented the prestigious Muhr Awards to the winners, which was held during a celebratory ceremony that took place in the Souk Madinat Theatre at Madinat Jumeirah. Winning the Best Director in the Muhr Emirati category was Abdullah Aljunaibi for his thrilling film ‘Camera’, winner of the Best Emirati Feature went to ‘Sharp Tools’ directed by Nujoom Alghanem, whilst ‘Escape’ directed by Hana Alshateri and Yaser Al Neyadi was named Best Muhr Emirati Short. In the Muhr Short category, Special Jury Prize went to Cyril Aris for ‘The President’s Visit’ and the Best Muhr Short went to gifted director Mahdi Fleifel for ‘The Drowning Man’. In the Muhr Gulf Short category, Best Muhr Gulf Short went to the deserving Ulaa Salim for ‘Fædreland (Land of Our Fathers)’, and Dhyaa Joda was awarded the Special Jury Prize for her compelling film ‘Sabyea’. The Muhr Feature category saw Lucien Bourjeily awarded the Special Jury Prize for his feature ‘Heaven Without People’, while Ziad Khalthoum was presented with the Best Muhr Non-Fiction Feature prize for ‘Taste of Cement’, and winner of the Best Muhr Fiction Feature was handed to Annemarie Jacir for ‘Wajib’. Taking home Best Actress in the Feature category was Menha El Batroui, for her role in ‘Cactus Flower’, and she was joined by Mohammad Bakri and Saleh Bakri as a joint Best Actor award for ‘Wajib’. Best Director was presented to Sofia Djama for her outstanding film ‘The Blessed’. DIFF also announced the recipients of a range of awards granted to talented individuals whose work helps support the Festival and the local industry. Sanjay Shankar fromMiddlesex University Dubai was presented with the esteemed Young Journalist Award for his tireless work reporting from the Festival, with the support of the region’s leading media outlet, Gulf News tabloid!. Celebrating works that address key social issues and awareness, DIFF again partnered with the Emirates’ Ministry of Interior for its Cinema Award, which was presented to Rawia Abdullah for her project ‘The Contact Line of Domfront’ along with a cash prize of $100,000. Celebrating the craft of storytelling, Sajda Almuallemi was awarded the Arab Film Studio Scriptwriting Award for her compelling work ‘Unexpected Holiday’. The People’s Choice Award was presented to ‘Goodbye, Christopher Robin’, directed by Simon Curtis, as judged by DIFF’s diverse audiences. Since being established in 2004, DIFF has grown to become an influential platform for the region’s most talented artists to showcase their films. As part of this, the Dubai Film Market was conceived to provide production and post-production funding and support for budding directors in the region.